You are here: Home / Family / Kids / Skip the Training Wheels – GET the Balance Bike! Skip the Training Wheels – GET the Balance Bike! We have had a lot of kid vehicles in this house. I imagine that’s pretty normal when you have growing small people. I had no idea the decision tree I’d need when I started looking for rides for my two smalls. Ride-on cars, scooters, big wheels – those are all well and good. 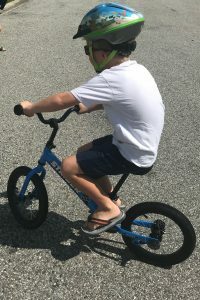 But in the mom groups that I’m part of, there seem to be frequent discussions about balance bikes vs. traditional bikes with training wheels. 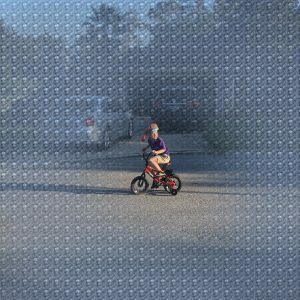 If you are debating which way to go – the adorable trike, the tiniest, cutest little bike with training wheels vs. a balance bike – I can tell you that balance bikes get the near-unanimous vote these days. So, let me tell ya the Brooke and the Boys Bike story. LEARN from my experience, friends. 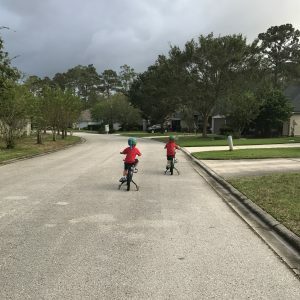 When the boys were old enough to ride some sort of self-propelled vehicle outside of the house, I envisioned us taking a spin together around our neighborhood on bikes, hauling bikes to the beach, and riding local nature trails. Please note that this article may contain affiliate links. You can read my full disclosure here. I had heard the feedback that balance bikes were the best, so I bought these Chillafish Balance Bikes for toddlers. They are awesome. We used them only inside, and the boys looooved zooming around the house on them. I have scoured my 459,341 photos and cannot find a single picture of them on their Chillafish bikes. I am SURE they exist. If I find any, I’ll update this post because seriously, it was precious! I start to think hmmm … learning to peddle would probably be good. And being able to go on rides outside would be good too. I didn’t want to take the Chillafish outside – they were the indoor vehicles for us. I didn’t want to bring outside gunk inside. So, for their second birthday, I got the adorable classic trike. A Radio Flyer Tricycles – the 4-in-1 Stroll ‘N Trike, to be exact. I’ll tell ya though – trying to steer two 2-year-olds at the same time on these things was not the easiest thing to do. Especially when one kid liked peddling more than the other one. Santa decided that regular Huffy bikes with training wheels were the answer to the biking dilemma. RED ones! With FLAMES on them! Welp. Once again, one liked to ride the bike and one was less enthusiastic. What, with all that peddling that needed to be done. 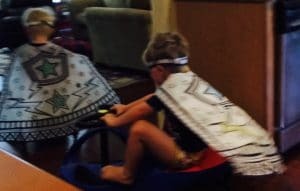 This is a picture of two caped superheroes zooming around the house on Plasma Cars! It is blurry but I had to show it because it is SO cute! I have a video of this somewhere I’ll have to dig up. It’s adorable! 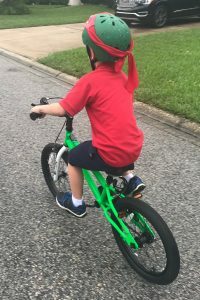 But their knees were now hitting the handlebars of the Huffy bikes, so I thought maybe it would be easier for them to go from training wheels to two-wheels on bigger bikes now that they were taller. So, I surprised them one afternoon with new “big kid” bikes – these from RoyalBaby. They had training wheels, but I was sure we would be able to ditch them pretty quickly! The boys liked their new bikes – but they were really too much bike for them, and they relied heavily on the training wheels for balance – especially with how the road slants to the side for water runoff. 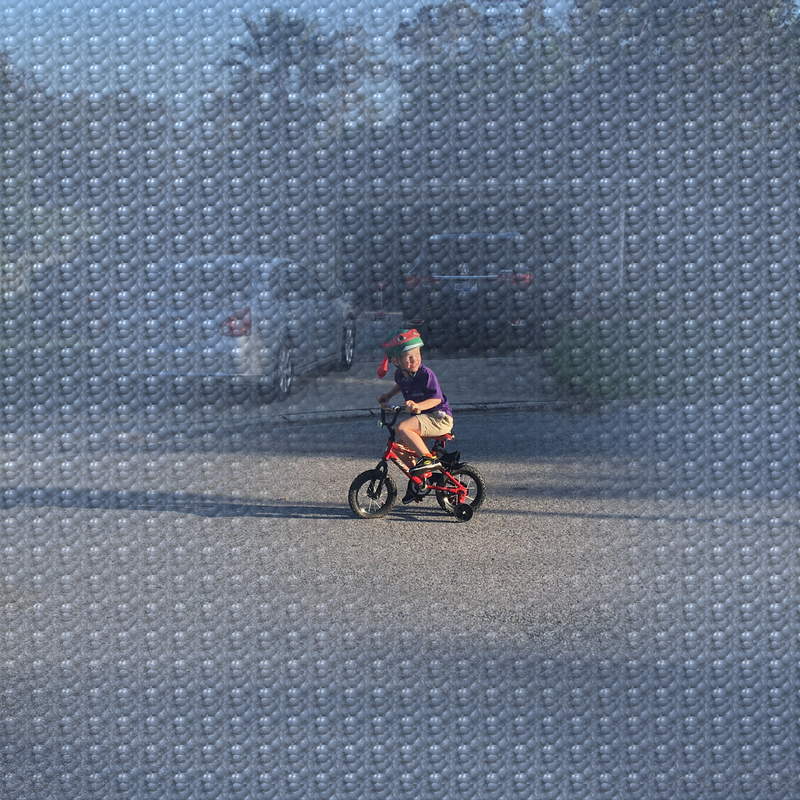 Aside: I may have run over one of the training wheels in the garage one day, and had to replace them with generic training wheels – which weren’t great and contributed to several tip-overs. Whoops. You can see in this picture below how leany they are. With hopes of moving the needle on this bike-riding project, Santa bought ME a new bike shortly after the boys got theirs! Whomp Whomp. That didn’t have the effect I’d hoped for. So all the bikes just sat in the garage. 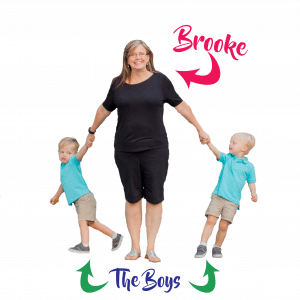 A twin mama friend of mine posted on Facebook that she was ready to part with her boys’ 12″ Strider Balance Bikes. Luckily, I somehow was the first person to jump on that and snapped those things up! I was READY for these boys to ride! I got them home and the boys tried them for a few days – but really they had outgrown the 12″ balance bike just like they’d outgrown the 12″ regular bikes. This is Reid on his a couple of months ago. Once the summer cooled off some, we took the Striders out to make a concerted effort. It sure didn’t take long for the boys to get the hang of it. After only a few days each, they both asked me to take the training wheels off of their big bikes. This is Jake riding his two-wheeler! The Strider 2-in-1 bikes are smaller than the big bikes, so I told the boys I would put the pedals that came with them on so they can learn how to pedal with a little more control. We have had a couple of wipe-outs on the bigger bikes – no fun. AAALLLLL I wanted was to be able to go on family bike rides. I would have been able to do that much sooner than now – like YEARS sooner – if instead of spending the cash on all the other bikes – I had JUST spent the money on the balance bikes, to begin with! 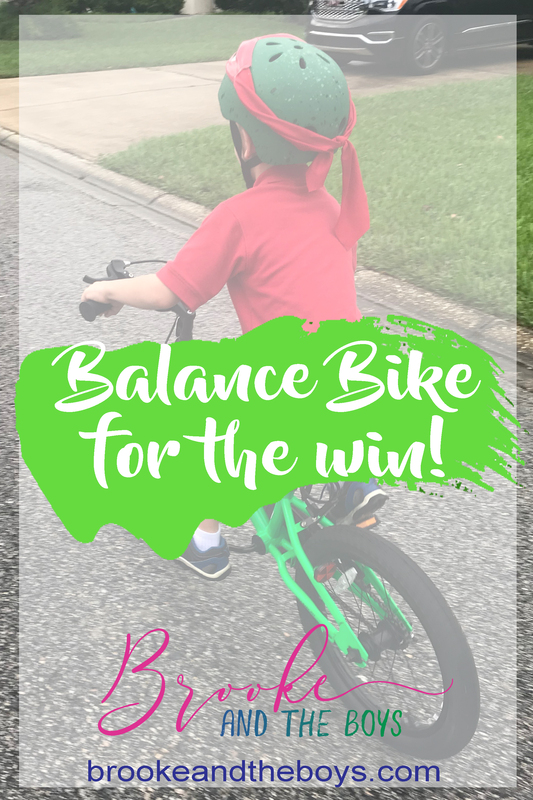 …SKIP THE TRAINING WHEELS and get the BALANCE BIKE! I promise you will be SO happy you did!